Power To Grind: World's first cordless grinder with corded performance. Utilizing a POWERSTATE Brushless Motor, the M18 FUEL 4-1/2 in./5 in. Grinder, Paddle Switch No-Lock, delivers maximum sustained power to complete the toughest grinding, surface prep and cutting applications while providing a lower cost of ownership with up to 10X longer motor life. The thin body design delivers optimized balance to rest easily in the users hands. 100% tool-free-tool - No wrench, No Screwdriver, No problem: Tool-free accessory change to easily change all accessories without a wrench and a toll-free adjustable guard for quick guard installations and adjustments. The M18 FUEL 4-1/2 in. / 5 in. Grinder, Paddle Switch No-Lock proves corded durability in a cordless tool by utilizing the same metal housing, gearing system, guards, flanges and anti-vibration side handles as legendary high performance corded grinders. The DEWALT FLEXVOLT DCG414B 4-1/2-in - 6-in Grinder with Kickback Brake has the power to cut and grind. The Kickback Brake engages when a pinch, stall, or bind-up event is sensed and the electronic brake engages with maximum force to quickly stop the wheel, reduce the movement of the grinder, and shut the grinder off. The brushless motor is designed to deliver the run time and performance for demanding applications. Includes: DCG414 Grinder, Side Handle, 4-1/2" Type 27 Wheel, 4-1/2-in Type 27 Guard, 6-in Type 27 Guard, Wrench, and Flanges. Battery and Charger not included. M18 FUEL 18-Volt Lithium-Ion Brushless Cordless 4-1/2 in. /5 in. Grinder Kit W/ 5.0Ah Battery Power To Grind: World's first cordless grinder with corded performance. Utilizing a POWERSTATE Brushless Motor, the M18 FUEL 4-1/2 in./5 in. Grinder, Paddle Switch No-Lock, delivers maximum sustained power to complete the toughest grinding, surface prep and cutting applications while providing a lower cost of ownership with up to 10X longer motor life. The thin body design delivers optimized balance to rest easily in the users hands. 100% tool-free-tool - No wrench, No Screwdriver, No problem: Tool-free accessory change to easily change all accessories without a wrench and a toll-free adjustable guard for quick guard installations and adjustments. The M18 FUEL 4-1/2 in. / 5 in. Grinder, Paddle Switch No-Lock proves corded durability in a cordless tool by utilizing the same metal housing, gearing system, guards, flanges and anti-vibration side handles as legendary high performance corded grinders. M18 FUEL 18-Volt Lithium-Ion Brushless Cordless 4-1/2 in. /5 in. Grinder Kit W/ 5.0Ah Battery is rated 4.9 out of 5 by 7. Rated 5 out of 5 by Os2008 from Milwaukee Cordless grinder Very durable reliable and long lasting best grinder I had. Rated 5 out of 5 by Grumpmeister from good as advertised So far so good, I have tore up some grinding wheels cutting old steam heat pipes and the battery lasts longer than the wheels. Rated 4 out of 5 by MrFixIt from A solid grinder for the M18 family This review is a comparison between the last generation wired Milwaukee 4 1/2" grinder and their latest M18 cordless offering. I've used a Milwaukee angle grinder for everything from cutting & grinding concrete to smoothing out rough-cut metal. Unlike a drill or a saw that operates linearly, a grinder needs the freedom to change angles quickly and often as an operator makes changes and adjustments to the workspace on the fly. This presents a perfect opportunity to go cordless, and Milwaukee has taken the bait. PACKAGING The Milwaukee 2780-20 grinder comes with a chuck tool, one battery, one charger, and a wider guard for thicker grinding disks and brushes. The first thing that immediately caught my eye was the single battery. I am a big advocate of two batteries, so that when one runs out, you've got a charged one ready to go. But my concerns were alleviated when i realized that this was an M18 product. More on that below. One thing that was obviously absent was any actual disks to go with this grinder. This means that to actually USE this grinder, you need to go out and buy the grinding disks and cutoff wheels you need. Not a big deal, as every user will buy this for a different reason. Another thing that is immediately evident is the size of this case. Measuring at 18.5" x 14.5", this thing is a small suitcase, in stark comparison with the cardboard box my last grinder came in. As you can see, the charger takes up the a large portion of of the case. 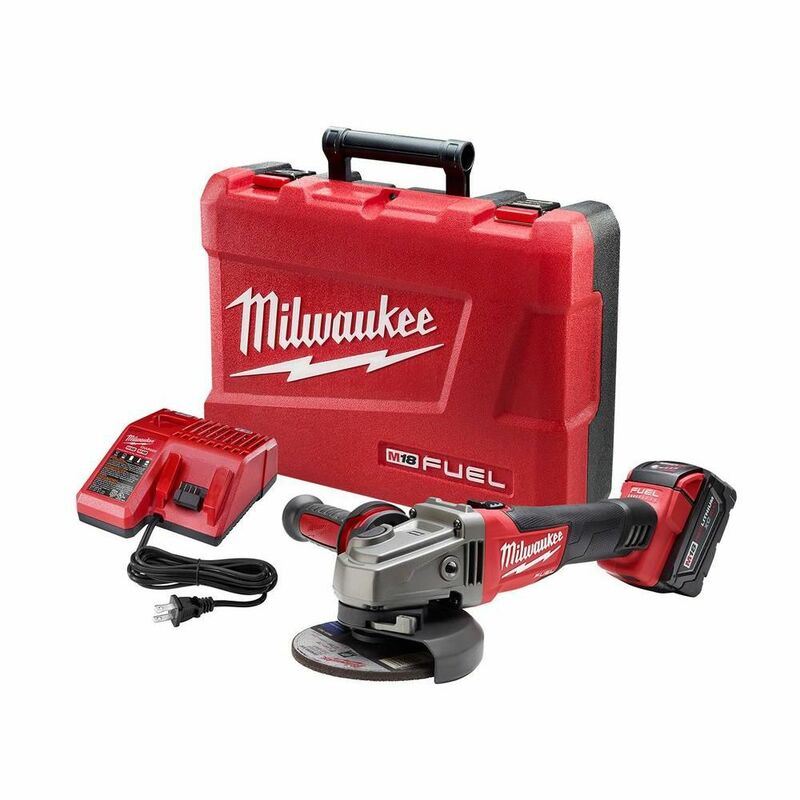 M18 TECH This grinder features the much touted Milwaukee M18 battery 18V technology. Featuring low temperature operation and double the lifetime of competing products, the M18 battery line is sure to please. There are close to a dozen tools featured in the Milwaukee cordless tool line that make use of these M18 batteries. The Red Lithium (LiIon) Battery pack has a fantastic feature where with the press of a button, you can see the battery level of the battery pack. This means you'll never be caught off guard with a dead battery in the middle of a project. No need to carry spare batteries with you to the work site. The downside is that these batteries are pretty hefty in weight. One XC4.0 battery (included) weights a whopping pound and a half. Additionally, the chargers are meant to be universal for all of the M12 & M18 product lines, meaning that they'll be unusually large, and host additional charging ports that are of no use for this product. GRINDER COMPARISON The M18 cordless grinder weights in at nearly 6 LBs (!) which is noticeably more than his cordless sibling (4.5 LBs). However, when you remove the M18 battery, the grinder's weights are nearly identical. Unfortunately, this means that your arm will become fatigued quicker with the cordless model in exchange for the cordless freedom. Another feature is that the cordless grinder accommodates up to a 5" grinding disk/wheel. The corded version maxes out at 4.5." However, Home Depot only caries 4.5" disks, so i'm not sure this is much of a benefit. The cordless unit is also over 2" longer, mostly to accommodate a better sense of balance in the unit. PERFORMANCE This is my first M18 tool. I wasn't sure what to expect. However, i'm quite pleased with the performance. I had no problem cutting concrete with a cutoff disk. The battery held up to quite a load, and didn't excessively strain the motor with even a large amount of pressure against the concrete. The cordless freedom is definitely appreciated, as you have limitless range and mobility. The all rubber grip allows for easy holding of the grinder. There is no kickback when powering on this tool. However, this unit is surprisingly noisy for a battery operated tool. SUMMARY From what i can tell, this cordless unit works just as well as its corded brethren. The M18 battery technology is impressive in its longevity. But then again, it should be for its size and weight. This mobility comes at a price premium. The grinder itself is well balanced, and easily usable. But at over 16" long, it is unwieldy without the handle installed. Surprisingly loud for a battery operated unit. The extremely large plastic case comes with an oversize charger, yet doesn't have much room to store spare disks & wheels. Overall, a solid addition to the M18 family. Rated 5 out of 5 by mcknzy from Put up against any electric. I really like this cordless grinder,Milwaukee didn't skimp on Quality or power and the battery is long lasting. It came with a wrench for disk changes and two protective disk covers for grinding and cutting.The battery took an hour and 5 minutes to charge but its the beefy 4.0 so i knew it wasn't going to be a 30 minute charge.It is heavy and well made and should last a long time.One note The battery charger that came with it will charge all Milwaukee's M18 batteries as well as a charging port for the M!2 batteries so if you have the M12 like I do you can charge them at the same time.I really like that. This is one of those tools that you don't know you need till you get one then all kinds of possibilities pop up.I love mine and highly recommend it.Great job Milwaukee.